The scene is again set for a new major international financial crisis. Central bankers, leaders of institutions such as the IMF, the OECD and the Bank for International Settlements are all aware of the situation. Many articles in the specialized press proclaim it. One of the factors is the enormous accumulation of debt by large private companies and the way these debts are used. In order to defend this capitalist system that so nauseates public opinion soothing declarations announcing strong measures supposed to “clean-up” the system have multiplied, but nothing has really changed. In fact, the policies chosen by the governments and the central banks are very favourable to big capital, particularly the big financial corporations. Not one strict measure has seriously pressed the holders of capital to reduce their high risk practises or speculation, or invest in tangible production. Crises are essential mechanisms in the capitalist system but they are not all alike. We do not intend, here, to do another analysis of the general causes of the crises of capitalism. Rather, to identify the factors which are certainly leading to the next great crisis. When it happens all the pundits, in governments, central banking and the mainstream press will pretend to be as surprised and even shocked, as they always do when bubbles burst. To oppose the system it is fundamental to point the finger at those who are at the origins of the crises and to show how Capitalism works in order to impose different principles and to break radically away from the Capitalist system. Since 2010, thanks to the policies of low interest rates practised by the Central Banks of the most industrialised countries (Federal Reserve (The Fed) in the US, European Central Bank(ECB), Bank of England, Bank of Japan, Swiss National Bank, among others), the big Corporations have become massively more indebted. In the U.S. for example, corporate debt increased by $7,800 billion between 2010 and mid-2017. This produces two advantages: 1) the share price goes up; 2) share holders can be remunerated and at the same time avoid paying taxes on profits. What is more, in some countries capital gains are taxed at low rates (compared to income tax or VAT). Already in 2014, buybacks of shares amounted to $40- $50 billion monthly. (1) The trend has continued since. It must be noticed that the same phenomenon happened previously as from 2003 and built up to a climax in September 2007 when the ’sub-prime’ crisis was at its worst. Between 2010 and 2016 North American Corporations bought back their issued stock to the tune of $3000 billion. 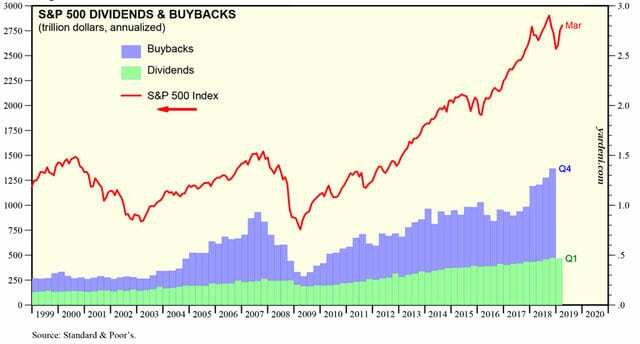 (2) As the French financial daily Les Echos headlined, “Wall Street driven by record stock buybacks.”(3) The high quotation of stock market indexes, not only in the US, is the result of massive buybacks. Corporate stock market values are therefore totally artificial. 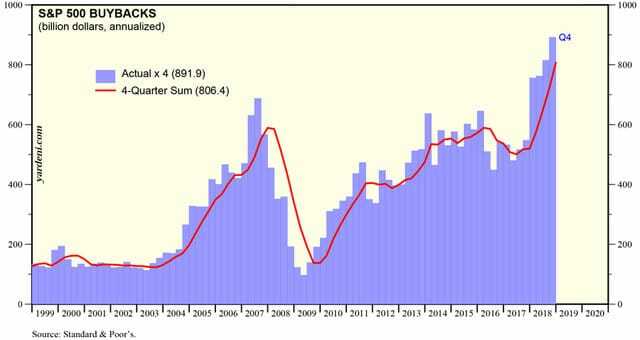 Volume of buybacks by Standard and Poor’s (S&P) 500 index of U.S. Corporations between 1999 and 2019. Source. Dividends paid to shareholders between 1999 and 2019. Source. Comparing buybacks (in blue) and dividend payments (in green), between 1999 and 2019, with the movement of the of the S&P 500 share index over the same period (the red line). This index considers the 500 biggest U.S. Corporations and S&P is one of the big three Credit Rating Agencies that quote country risk. 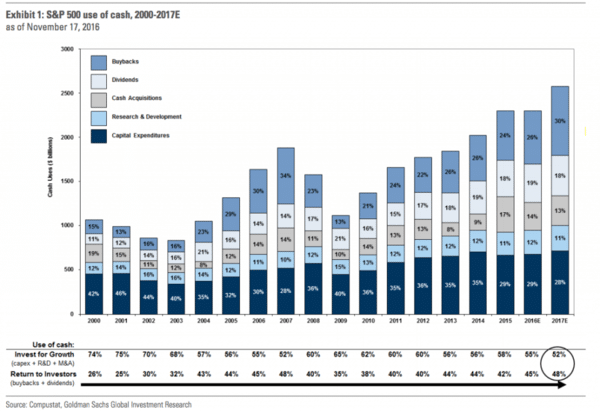 S&P 500 Corporations’ use of cash reserves between 2000 and 2017. We notice an increase in buybacks and dividend payments between 2002 and 2007, then again between 2009 and 2017. In 2017 spending on buybacks and dividends amounted to 48% of cash reserves. In the imaginary capitalistic world of the economics text books Corporations issue shares on the stock exchange to raise money for productive investments. 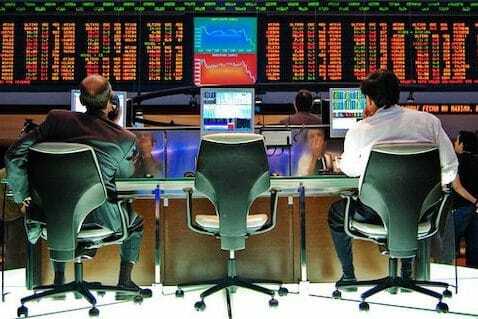 What they really do is borrow from banks to buy their own stock in order to increase the value of issued shares, increase the value of shareholders’ parts and give the impression that their corporation is in excellent health. The acting directors who are remunerated in stock options, that is, shares in the company they direct and that they may eventually sell, benefit directly from the increased value of their stock. The lord helps those who help themselves. Let us note too that CEOs have been very generous. Between 2010 and 2016 U.S. shareholders received $2000 billion. 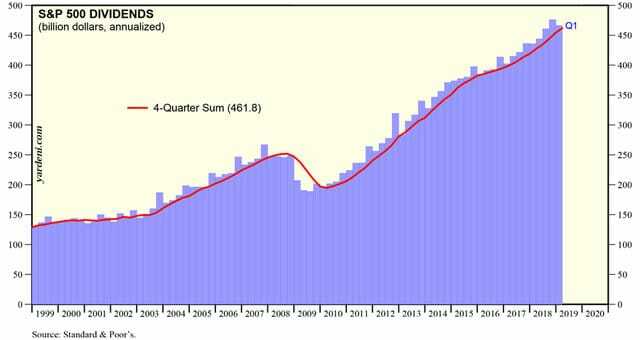 Added to the buybacks U.S. shareholders made $5000 billion over those six years. Meanwhile corporate balance sheets show an increase in liabilities pertaining to debt while shareholder equity is proportionally reduced. Should interest rates on corporation debt increase the payments may become unsustainable and lead to bankruptcies. Also, should the price of shares that are artificially buoyant fall sharply, this could also lead to bankruptcies. Massive buying back by big North American Corporations such as Hewlett Packard (HP), IBM, Motorola, Xerox, Symantec or JC Penney, has no rational, economic, industrial, commercial or social advantages. They buy structured financial products made up of credits on other corporations or personal loans. They mostly buy corporate or public obligations. Apple alone, in 2017, holds $156 billion of corporate debt, about 60% of assets. (4) Ford, General Motors and General Electric hold a lot of corporate bonds. Ebay and Oracle assets are bonds of other companies to the tune of 80% and 75% respectively. The thirty main U.S. non-financial corporations that act on the debt markets hold a total of $423 billion of corporate debt and commercial paper securities, $369 billion in public debt and $40 billion in structured products such as asset-backed and mortgage-backed securities. Seeking maximum income from the securities they hold on other companies they tend towards higher risks in companies that are in more fragile situations trying to draw in funds by offering greater returns, and thus expanding the credit risk market. As interest rates climb the value of corporative debt sinks. The greater the share of sinking corporate debt in a company’s assets, the greater the negative impact on the corporate balance sheet. The corporate equity value sinks too and may get to a point where it no longer covers its obligations. In 2016 Apple informed U.S. authorities that in the case of a 1% increase in interest rates it would lose $4,.9 billion. (5) Of course, just like other companies Apple borrowed to finance its debt purchases. In 2017 Apple has already borrowed $28 billion, bringing the total to $75 billion. This, by domino effect, could produce a crisis of similar ampler to that of the U.S. financial crisis in 2007-2008. The situation described here illustrates a new step in the financialization of Capitalism: The big non-financial corporations continue to develop their financial investments. The financial departments of Apple, Oracle, General Electric, Pfizer, Ford or General Motors grow and take ever greater risks seeking ever greater profits. Whereas, previously they lent 60% of their investment capacity to intermediaries such as money market funds, they now only grant them 50% and prefer, with the other 50%, to act for their own account. As well as increasing their profits they also increase the risks they take. What is more, a large part of the debt held on other companies is darkly processed through tax havens, which further increases the risk. The Bermudas and Ireland are among the principal tax havens used by big U.S. Corporations seeking to “optimize” legal tax evasion. This mountain of corporate private debt will be a prime element in the next financial crisis. But, crisis or no crisis, these capitalist practises in themselves are justification enough for the actions of all who struggle for the end of Capitalism and of the debt system. ↩Financial Times, “Return of the buyback extends U.S. rally”, 5 December 2014. ↩Financial Times, “Buyback outlook darkens for U.S. stocks”, 22 June 2017. ↩Les Echos, 18 January 2017 (in French). ↩Financial Times, “Debt collectors”, 16-17 September 2017. ↩Financial Times, “Patchy disclosure gives investors little to chew on”, 28 September 2017. Éric Toussaint, a doctor in political science, is president of the Committee for the Abolition of Third World Debt (CADTM) Belgium. He is a co-author (with Damien Millet) of Debt, the IMF, and the World Bank: Sixty Questions, Sixty Answers (Monthly Review Press, 2010). Toussaint has been serving as the scientific coordinator of the Greek Truth Commission on Public Debt since April 2005.